How cool is this? 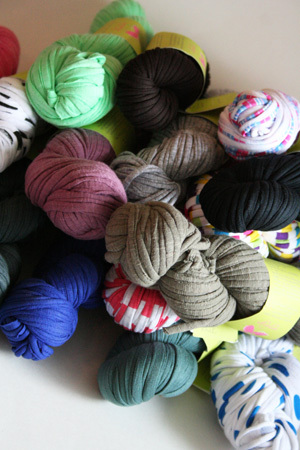 T-SHIRT Ribbon style yarn in Cotton blends - repurposed for our knitting pleasure. Made from recycled t-shirts (one of the reasons we can never predict what colors we'll have in stock) this is really a wild take on ribbon yard. Primarily cotton, they come with a free purse pattern on the yarn band. Very limited quantities. Free Pattern on the label for a cute honeycomb camera case - one skein makes two cases!